The other day Rightmove asked its users how they used Rightmove. We thought we would consider it from our standpoint today and provide you with our view on how to use rightmove. With various ways of accessing Rightmoves data we have several options but for serious househunters the web site has to be the ultimate experience. Knowing that your saved searches and properties will always be in one place. We prefer using the web site and the making sure when we use our mobile we sync the results to our account. So we recommend you log in to your account as you can then save any properties you discover regardless of which computer or application your using. Rightmove Mobile is made to sync with your online account as is the iPad and iPhone versions. The Rightmove iPad app is free and avaialble on the app store. It uses the same database as the standard web site, so you won’t miss any properties. It enables buying and renting property. Simply use the ‘Rent’ tab to see all the latest properties to rent on the iPad. So I know many of you make a coffee, put your legs up and explore over a million UK properties for sale or rent at your fingertips using the iPad. The iPhone version is ideal if your on the move and need to have a very quick access to the knowledge on local property. Similar features to the iPad version, but also boasts a QR code (Quick Response code). This is a type of bar code that can be easily scanned with your smart phone. It will take you straight to a web page, without the hassle of typing in long and complicated web addresses. The iPhone app boasts Maps, account syncing, floor plans, bigger images than the previous version and of course is free to download. The newly re-launched Rightmove app has some great features. Rounds and rounds of intensive user testing and learning have resulted in this super-sleek, intuitive and completely free app. So wherever you are, you’ll have over 90% of the UK’s properties for sale or rent at your fingertips. Although the iPhone app is aimed at iPhone or iPod Touch users, you can also visit the mobile site on any smart phone including Android powered phones. 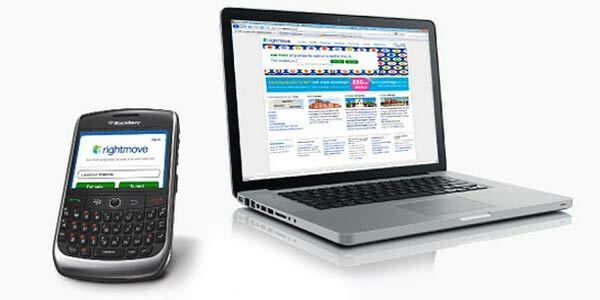 Mobile Site here or visit Rightmove web site and your phone should be recognised as a mobile. Easy access to your latest searches and recently viewed properties. Homepage created around your needs. Be notified of newly added or updated properties instantly on your desktop. Gallery view showing up to 100 properties per page. Sort by date added to Rightmove.